I recently re-read Jonathan Gatehouse's book The Instigator: How Gary Bettman Remade the League and Changed the Game Forever . "Two decades of lockouts, soaring ticket prices, and on-ice tinkering have convinced many hard-core fans that the NHL’s long-time commissioner Gary Bettman is the devil in disguise, but this book examines his motivations, peels back his often prickly demeanor, and explains how he manages to lead, confound, and keep order." That's the book's opening selling line, though it reallly had me intrigued after the opening chapter describes the bizarre story of what Gary Bettman was doing during the 2011 Stanley Cup riots in Vancouver. After that one chapter I had incredibly high expectations that this book would give us a real look at the man behind the corporate figure. Unfortunately the book never really gets back to that opening promise. There are even lengthy stretches where the author offers some very interesting behind-the-scenes looks at the more contentious business issues in that time, but almost forgets about the commissioner during these examinations. The look behind the return to Winnipeg, the television network deals and a possible Canadian government bail-out plan are fascinating storylines, nonetheless. It is important to remember to judge a book based on what it is, not what it is not. 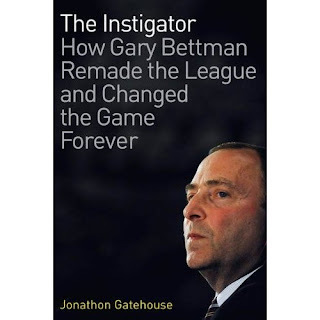 The Instigator: How Gary Bettman Remade the League and Changed the Game Forever has a lot to offer, especially as a detailed history of the business side of the NHL during Gary Bettman's reign. Anyone interested in these topics will find value in the text. Still, I find it disappointing that the book did not go where I had hoped it would - offering a whole new perspective on Bettman the man and and appreciation for the job he does.